The guys and girls at iFixit like tearing down gadgets, not for the thrill of shredding a poor phone in a blender or crushing it under 10 tons of bricks, but for scientific and nerdy purposes. They like figuring out how a phone is exactly built, how you can take it apart and put it back together, and how easy it is to fix at home for ordinary people who only have a couple of tools and enough common sense to follow instructions. Most of the devices iFixit has gone through in recent times have gotten poor repairability scores. Thanks to the move to unibody designs and non-removable batteries, phones like the Galaxy S7 and Nexus 6P got a measly 2 out of 10 score. 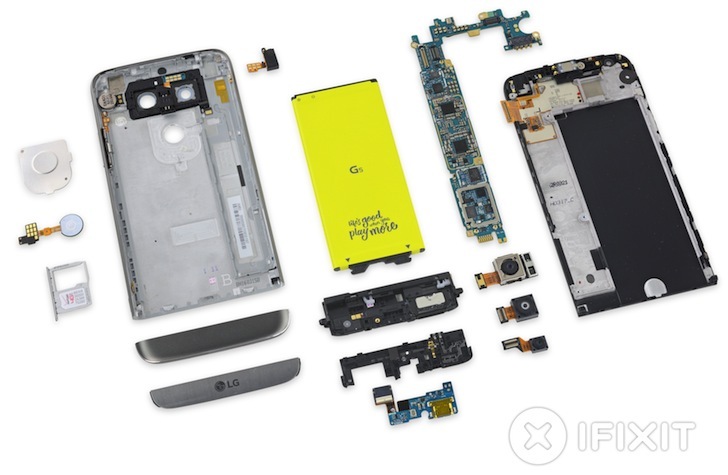 The LG G5, however, continues in the tradition of the G4, earning another 8 out of 10 repairability score from iFixit. The bottom pops out fairly easily, the battery is removable, everything is modular and easily replaceable, there aren't lots of things to unglue to take the phone apart, and the few screws used are standard Phillips #00. However, the fused display and glass will increase the cost of repair if one of the two is broken. You can check out all the gory disembowelment photos and step-by-step directions at iFixit's site, including a list of all the components and chips used by the phone.